Hi, Manic Readers! 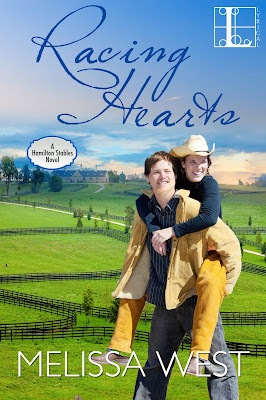 My name is Melissa West and I am the author of RACING HEARTS, the first in the Hamilton Stables series, featuring three Southern brothers and their struggles through life…and love. Today I wanted to talk about music and how instrumental (*winks*) it can be to not only the writing process but the reading process. Prior to writing RACING HEARTS, I wrote all five of my prior releases without music—without any sound at all, actually. I was of the opinion that for me to truly envision a scene and create that scene on the page, I needed absolute silence. I had to write without my family around, no TVs in the background, no chatter, no distractions, and no music. And this worked okay for me for the first few years of my career, but when I set out to write RACING HEARTS, I wanted a story full of heart. Above all else, I wanted to stir up reader emotions, and not just those for the romance, but for family, friends, and acquaintances. I wanted every scene to ooze feeling—happiness, sadness, you name it. But as I began writing the book, I realized the emotions weren’t ringing true. I wrote and rewrote, only to set the book down. It wasn’t until I realized that my brain was the problem that I was able to reach THE END. I was overthinking, when what I needed to do was feel, just like my characters. So, I created a playlist full of country music. Now to provide a little history here, you should know that I am Southern to the bone, born and raised, but I have never been a fan of country music. Still, I needed to create a picturesque town full of vivid characters, all with distinct personalities, all perfectly clear. I sat down with my new playlist and began writing, and one month later, RACING HEARTS was written. But something cool happened along the way. I learned that I enjoy listening to music while I read, too. It makes sense, really. Music can make or break a great movie, so why not a book? Now, I don’t blast it like I do when I write, but having music that is similar in tone to the book I’m reading helps me to dive deeper into the book and creates an even more amazing experience. Now, I’m 100% music when I write and at least 50% when I read, and I absolutely love it. What about you? Do you write or read to music? all with lots of kissing. Because who doesn’t like kissing? 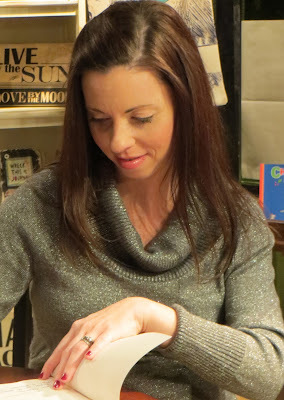 She lives outside of Atlanta, GA with her husband and two daughters and spends most of her time writing, reading, or fueling her coffee addiction.